Ralph Lauren Mens Polo Boots Oxfordable III Leather Hiking Shoes Sz. 12 M. Condition is Pre-owned. Shipped with USPS Priority Mail. These Ralph Lauren boots are in excellent condition! Don’t miss out! Condition: A pair of boots that has been worn and is in FANTASTIC condition. RUGGED RALPH LAUREN POLO BROWN LEATHER. The rubber toe is super hard like a steel toe boot would be. for traction.These boots have NEVER been used. The bottom soles are pre-scuffed by the manufacturer. Boots only worn a couple times. There in “like new” condition. Thanks for looking! Payment is due immediately after the auction ends. For your consideration is a pair of vintage men’s boots from Ralph Lauren Country, men’s size 12D. Please note- these boots show extensive wear especially on the torque of the boots, as shown in the photos. FOOTWEAR CONDITION CHART. MATERIAL : LEATHER / LIGHT INSULATION / LUG RUBBER BOTTOM OUTSOLES. COLOR : BLACK. DON'T MISS OUT ON THIS DEAL! However, opinions on condition can vary. NEW = New shoes. Good condition overall tread gently worn. These boots are in overall good condition. Sole has been repaired as shown in photos. We reply fast! 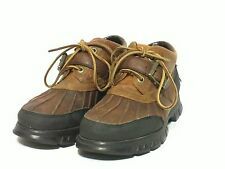 Men’s Ralph Lauren Dover III leather Upper waterproof duck hiking work boot. Black size 13D, good condition. Lace up and buckle. Beautiful leather Ralph Lauren Polo Sport size 7 1/2 D hiking trail shoes with rugged tread. 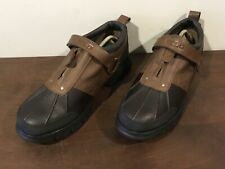 Ralph Lauren Polo Sport Leather Strap Low Duck Shoes Size 8.5. Ralph Lauren Polo Andres Black Leather Winter Boots Mens Sz 11D. Condition is Pre-owned. Shipped with USPS Parcel Select Ground. New never worn Mens Polo leather hiking boots Very nice! As shown. RECIEVED IN CONDITION SHOWN. WEAR AS IS.LOTS OF LIFE LEFT. RESERVE SET. We will find a way solve the problem.AS SHOWN IN PICTURES WEAR AS IS. FREE Trial ! AS SHOWN,,,,,AS RECIEVED/FOUND. Polo Ralph Lauren Leather Boot. Black pebbled Leather. leather lined. Padded leather inner sole. 6/0/50/054/0/66/0/78/0/87/0/89/0/1152/129/2/213/1/223/2/240/2/247/2/249/2. Ralph Lauren is the designer of this pair of leather hiking boots the boot have a ranger strap with logo buckle. There is a logo on the tongue, sole and inside the lining. Ralph Lauren Logo Embossed On The. Leather Winter Shoes/Boots. Brown Leather. Leather Upper With Synthetic Lining. EUR Size:37.5.